*From here until the end of this post, Executive Decision shall be referred to as "ED". So no, that's not Eating Disorder, Emotional Disability, or Enormous Donuts (only in my dreams!). ED: I got to school and played basketball with one of my fave students. She's graduating 8th grade and moving on to another school. She promises that she'll visit me, and bring me candy and yummy food on her free periods. My students know me too well, I think. The rest of my Friday consisted of autograph book signing (all of the eighth graders get them, then are excused from classes all day to get their favorite teachers to sign their books). How do I know I'm a fave? I signed every single kid's book.<3 Needless to say, I was just slightly an emotional wreck when I got home. I still got my nap. Saturday morning = my tummy was a mess. Girl parts (sorrrrrrrrrrrrrry, guys!) were doing their thing, and I was bloated and 100% uncomfy. ED: I skipped my run, knowing that I'd rather expend the little energy I had on teaching my group exercise classes. I walked into Suz's office at the gym to see the surprise she had left me. Just in time for SMOOTHIE SEASON! You can read Suz's review of this product HERE, or check out Bob's Red Mill Protein Powders HERE. Thank you, friend! <3 you so very much! This song came on during my Yoga class, and I was reminded of how much I used to love doing solo Yoga to it years ago. (Yes, it's the song from the theme of "House, M.D. ":) Do some songs remind you of your earlier fitness days? I got home and found Sophs and Harry already rocking the house. ED: This kid was totes getting Annie's Mac n' cheese + broccoli for lunch. Soph eventually (see what time it is?!) made her lunch, and seriously? She used to have to use a stool to do this.<3 I gave her some super-amazing words of wisdom ------> Stop growing, already. ED: Because I was still feeling VERY yucky and uncomfortable, I opted to stay behind from going to BBQ fest with those two. What'd I do instead? Had a yummy snack and watched "Friends". After Harry and Sophia got home, we opted to chillllllllllllllllll. Sophs joined me for "Friends", but her idea of "watching" was from under the coffee table. I can relate; being in enclosed spaces makes me feel more comfy, too. ED: I didn't take a picture of my breakfast before I ate it, so I decided to show you what it looked like after it was gone. Yeah, I'm weird. ED: I decided to show you my FAN-TAST-IC lunch before I devoured it. You're welcome. No ED here, although making the decision to not have a meltdown because the bottle of shampoo in my beautiful gym bag had exploded, and rather got myself together and started cleaning it, should totally be rewarded (send ice cream, Nutella, and/or Swedish Fish). It's a good thing I sent Harry off to drop off Sophs, otherwise I would've found this late in the afternoon. ED: Two for Harry: He picked up a beer for Cali, and we already had one for the Cleve. We like to include beer representations for teams and/or movies. ED: Harry also suggested that we have (frozen) pizza for dinner. He gets a smooch for that. ED: At least I added some rabbit food next to it. Harry was *slightly* peeved that I threw some salad on his plate, as well. He couldn't have been all that mad. He ate the salad. ANYWAY. This happened shortly after dinner, one episode of "Inside Amy Schumer," and three quarters of the NBA Finals. Thanks for reading all of THIS babble! Have an absolutely Maaaaaaaaaaaaarvelous Monday! Morning spin, afternoon swim for me! Random Q: Do you call, text, Tweet or Facebook people the most? Did you make any EDs this weekend? Doooooooo tell! CONFESS -- What time did you hit the sheets last night? Yesterday I made the ED to bike instead of run. Which means I'm heading out into the already hot, humid early morning for some miles before work! I do not miss my lady days. ick. 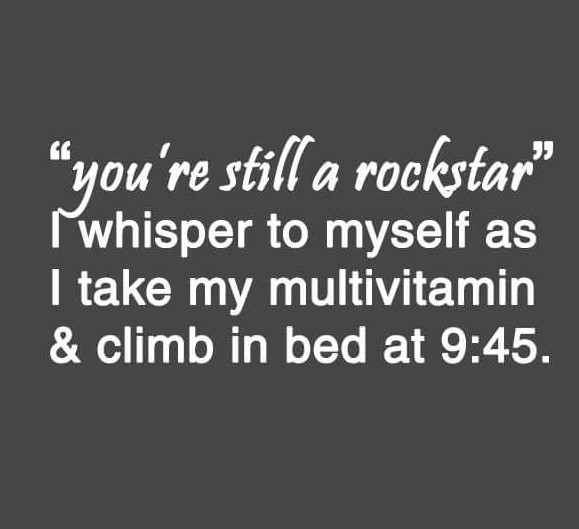 Rock on, girl. I'm with you on the yucky miles. Sorry to hear about the lady parts making their presence felt, and about the shampoo exploding in the gym bag! Both are so frustrating. But hurray for the protein powder, signing all the autographs, kickboxing, and pizza. Some songs totally remind me of earlier days and where I was when I heard them! I enjoyed your babbling. And that pizza looks so delish (my man would grumble about salad, too). Let's see, today I did a BW workout in the AM, then just did an easy run on the treadmill because it's 90 something out there today. I had a dentist appt. in the AM so just couldn't get my run in then. I do different things for different people. My parents don't text and while my dad is on FB, he rarely checks it. I have a friend I run with who doesn't do FB. And I don't have unlimited text or phone . . . it really just all depends! I feel like I'm right about the same mix of commo as you. OH MY GOSH, come over and I'll make you some!